The Targetworx Target Retrieval System opens a new chapter in target retrieval systems. The days of using cables and electric bus bars are over. What makes this possible is the carrier, which houses onboard the power supply for 30 hours of continuous use as well as the electronics to control the carrier and charge the battery. The system eliminates the need to "calibrate" a rail due to worn sensors, wheels, or stretched cables. When you send a target to 50 feet, it's at 50 feet, exactly. As is the case with almost all our parts, our drive and turning motors are made in the USA and are of the highest quality. While they cost us ten times more than cheap imports, they are expected to last the lifetime of the carrier. The electronics were designed and programmed in house, using the latest LCD LED backlight technology and a 7" touch widescreen. Learn more by watching the system in action. Want to learn more and discuss your range needs? We're here to receive your email or call. Our new for 2014 shooting booths were designed with input from many current range operators. The booths are made from 1/4" AR500 steel. They are 4'6" deep and go all the way to the safety ceiling. Being 4'6" deep, changing targets can be done without exposing limbs downrange of the booth. 8'5" tall helps to block brass from hitting adjacent shooters. There are two versions. One with level 5 ballistic glass and the other without glass. Instead of awkward benches we use a custom made rolling table that locks into place magnetically. The top is coated with spray polyurethane and trimed in oak. Booth skins are also coated with spray polyurethane. This provides for some sound absorbtion with the ability to easily wipe clean. All metal components are powder coated. Folding barricades are an option. They fold back but do not block the view through the glass. Open they lock into place with two 90 pound magnets for a solid, secure barricade. Rubber bullet traps are not complicated. However they can be built a myriad of ways. As with everything we build, we choose to use the best materials and proper design. Our support structure is covered in 1/4" AR500 plate, including seams, and set at 30 degrees. Side walls are 1/4" AR500. Both are primed and painted prior to rubber installation. Rubber is clean and coated with a liquid fire retardant during installation. One of our installations recently took over 20 tracer rounds on two seperate occasions. While they required a little help from a fire extinguisher, there was no doubt this liquid fire retardant saved the range. It's expensive but worth it and included as standard in all our traps. TargetWorx can design, manufacture, and install a private indoor shooting range in your house, basement, garage, or other building, close to the cost of a swimming pool. Private ranges can be installed in an existing structure, or we can work with your architect to incorporate a range in new construction. Each range can be designed to suit your needs. 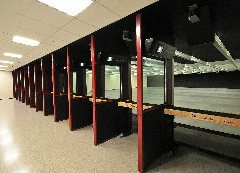 Primarily private ranges are set up for pistol calibers, but rifle calibers can be accommodated. Everything that can be done to keep fired shots within the range will be incorporated into the design. The range will contain a safety ceiling and walls, all covered with ballistic rubber, in addition to a primary impact area. An air system, lighting, primary bullet trap, and sound insulation are designed into the range. The range area can also incorporate a vault for gun storage, which can also be used as a safe room. 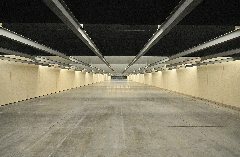 You don't have to be a competitive shooter to consider enjoying a private indoor shooting range. Starting around $30,000, it's rather affordable. The novelty of it would make for great conversation, resale value, and it might even get used more than a pool! Contact us to discuss the possibilities.